MY FAVOURITE POLISH OF ALL TIME. As you can tell from the post name, it's butter LONDON's All Hail The Queen!!!! I am pretty sure I even once told butter LONDON Canada that if there was a zombie apocalypse, I'd bring this one with me.. yes this is what I think about during the commercials between Walking Dead..don't judge me!! haha. I mean, who wouldn't... it's a perfect colour for any occasion.. job interviews (which I wear to every one; and that's why I have it on at the moment haha..), drinks with the girls, a drive to Starbucks, late night movie, tea time, when I feel like I don't know what to wear, meeting The Queen?? fighting zombies?? yeah any of those haha..feel free to add more. Where would you wear this colour to? I'm really happy this shade matches my skintone so well. If it doesn't for you, I also recommend trying out other shades butter LONDON offers (they have a ton!!). They did have a neutral collection out before called Starkers but they're LE and D/Ced by now. All swatches are 1 coat Essie Grow Faster, 2 coats butter LONDON All Hail The Queen and 1 coat China Glaze Fast Forward Top Coat. I feel my nails look a lot nicer when I wear it - more elongated, neat and clean! The subtle shimmer/holographic effect doesn't make this shade look dull and totally distracts me while I am writing this post! Okay wow I rambled a lot but how could I stop? 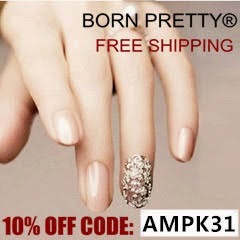 hehe..
3 Free Nail Lacquer - free of formaldehyde, toluene and DBP. It is a tad expensive priced at 17.50$CAD at Sephora, The Bay, Holt Renfrew etc but it's totally worth it :)!!! or follow them on Facebook (Canadian) here. One of my faves to...its very pretty,my camera can never pick up just how pretty this is when i used it.